The Twin in Berlin: Even Though We May Not Think So, We ALWAYS Have A Reason To Be Thankful. Even Though We May Not Think So, We ALWAYS Have A Reason To Be Thankful. Welcome to the last week of the transfer!!!!! ahhhhh this means my last week of being a trainee!!! at last!!! well formally a trainee, i think ill still feel like it for at least a few more months...transfer calls are on Saturday, yikes! Glad you’re having Pina Pizza for Thanksgiving!! Think of me pleeeeaseeee!!!! sister Harris learned from a lady from Africa how to tie the turbans. legit right?! Glad you got the letter. I’ll try writing one today. I think I like writing letters better too, pops. I got a flu shot! The mission is paying, thank you! soooo this week flew by!! Sister Harris is probably the most happiest person ever. She uplifts me everyday, and I just love serving with her! She makes other people feel so loved and special. Love it. Love her. We have sort of hit a rut with some of our investigators in the past few days. Sometimes, well most of the time, agency can be quite frusturating! People have good intentions, but until they act on these intentions and feelings they cant progress!! We did get a call from some kind of wacko sounding dude who wants to meet with us, so we'll be meeting with him later this week. A bit of a surprise, but hey the Lord works in mysterious ways. We finally got a hold of B! He wanted a priesthood blessing from the elders! He is trying to stop smoking again. I told him that he had done it before, and he just nodded his head, and said, " you’re right". Well auf deutsch of course. So he was more positive after we met with him! He thinks he has no time for baptism, but we are STILL trying to help him see how much it will help him RIGHT NOW. This week wasn’t too eventful, or I am just not thinking of everything that happened. Sunday was the PV Darbietung! aka the Primary Program!!! SOOOO PRECIOUS!! Sunday, yesterday, was the highlight of my week! Church was so fun with all the cute little German kids singing and giving talks! I love the Braunschweig ward so much. The members are all so awesome and solid. I was pretty overcome with love and gratitude for the ward during sacrament meeting on Sunday. It was so goood!! I love going to church! We also had TWO eating appointments, mittags with the Hellers, sister Heller is the Relief Society Prez so I thought of my momma. They gave us rotkohl which I loooovoe and klöße. soooooo delish. Then this pudding quark dessert. We took a train home, then got right on the straßenbahn to go to our next meal at the Jobs! Bruder and Schwester Jobs, and their 5 kids. I love them! Such a cute family. All 6 of us missionaries were there and we had tacos. I thought of hoooooome and home made salsa!!!!!!!!! and tortillas!!!!! People played piano and we all sang. The kids are sooo cute and Bruder and Schwester Jobs are soooo nice. Bruder jobs always talks in English and German, he is really funny!! It was such a nice time and I just had the best day ever! I love Sundays!! Also this ancient lady at church gave sis Harris and me home made bookmarks! She gives them to all the sisters and I finally got mine! So cute!! 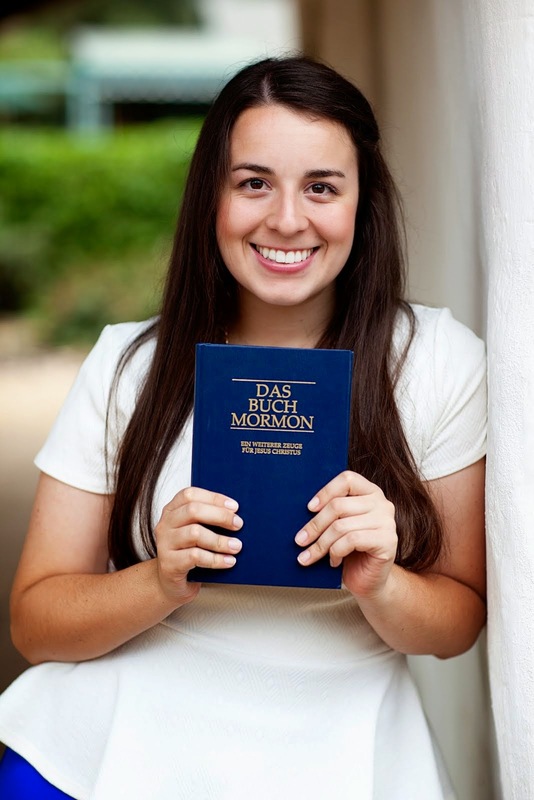 Soooo happy to read Hermana Mittleman's email and those twins wanting to get baptized. That's what's up! Love her and miss her tons. And you all too!! Welcome to Germany, Silver Fox Status!